. Ullberg's work is collected widely throughout the world and his monumental sculpture is featured in major cities around the globe as well. 21ft. bronze on stone, commissioned by American Re-Insurance Co. for Int'l Headquarters, Princeton,NJ. The Wildlife Experience, Parker, CO.
American Bank, Port Aransas, TX. the Swedish Government Tele-Com Center in Nacka Strand (Stockholm) Sweden. 1.25 lifesize, bronze, The Wildlife Experience, Parker, CO.
7ft. bronze on stone, commissioned by San Antonio Zoo, San Antonio, TX. 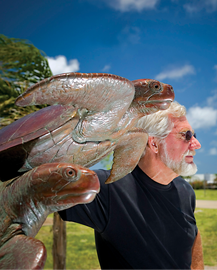 18 ft. bronze on stone, commissioned by Chub Cay Resort, Bahamas. Monument "Deinonychus - Terrible Claw"
11ft 9in. bronze on granite, commissioned by Genesee Country Museum, Mumford, NY. High Plains Art Council, placed in Benson Park Sculpture Garden, Loveland, CO.
Lincoln Harbor Yacht Club, Weehawken, NJ. City of Aransas Pass, TX. for Corporate Plaza, Boca Raton,FL. Entrance to Leigh Yawkey Woodson Art Museum, Wausau, WI. Anheuser-Busch, Inc. Visitor Center, St. Louis, MO. Whataburger Plaza, Whataburger Corporate Headquarters, Corpus Christi, TX. Gilcrease Museum - Permanent Collection, Tulsa, OK.
USAA Federal Savings Bank, San Antonio, TX. National Museum of Wildlife Art, Jackson Hole, WY. 15ft. with a 20ft. wingspan, bronze, commissioned by Federal Reserve Bank of Houston, TX. In association with Michael Graves & Associates. 21ft. bronze on stone, commissioned by Johnson C. Smith University, Charlotte, NC. 8ft. bronze on stone fountain, commissioned by the Charleston Harbor Hilton Resort, Charleston, SC. Corpus Christi Town Club, Corpus Christi, TX. Jean-Paul Richard - Paris, France. 21ft. bronze on stone, commissioned by Genesee Country Museum, Mumford, NY. 7ft. polished stainless steel on bronze, Municipal Art Gallery, Luxembourg. First United Methodist Church, Corpus Christi, TX. Mystic, CT. Memorial to Roger Tory Peterson. 23ft. polished stainless steel on black granite, for the Lincoln Centre, Dallas, TX. Unveiled - August 27, 1981. This monument was relocated to UT Dallas, Center for Brain Health. 9ft. bronze on granite, commissioned by Einar Mattsson Byggnads AB, Stockholm, Sweden. 7ft. bronze on stone, commissioned by Saint Eriks, Stockholm, Sweden. Sanctuary Golf Club, Parker, CO. Installation – June 2004.
by National Wildlife Federation Headquarters, Washington, D.C.
Leigh Yawkey Woodson Art Museum, Sculpture Garden, Wausau, WI. Installation- April 1998. 13.5ft. polished stainless steel on stone, commissioned by the Colorado Springs Fine Arts Center, CO.
Marine Monument "Sailfish in Three Stages of Ascending"
36ft x 150ft. bronze marine fountain, commissioned by the City of Ft. Lauderdale, FL. 19ft H. bronze mastodon, commissioned by the Denver Museum of Nature and Science, Denver, CO.
Urban Installation "Spirit of Nebraska’s Wilderness"
Fountain and cityscape composed of 58 bronze and stainless steel Canadian Geese and 9 bronze Bison. All sculptures are 1.25 life-size. Commissioned by the First National Bank of Omaha. Placed in downtown, Omaha, NE. 23ft. bronze on stone, commissioned by the City of Boca Raton, FL as a Veteran's Memorial. 4.5ft. x 22ft. bronze on stone, commissioned by the Grand Hotel, Norrkoping, Sweden. Monument "Whooping Cranes- Conservation Foundation"
Monument "Wind in the Sails"
23.5ft. bronze on red granite, commissioned by the Corpus Christi Caller-Times. Bronze casting, commissioned by the Port Authority of Laeso as a sailors' memorial. 21.5ft. bronze on granite, 20ft. wingspan. Commissioned by the University of N. Carolina.